Attacks from the air during World War II had a devastating effect on London’s Royal Docks and the people who lived and worked in the area. The bombings began in July, 1940, but the start of what’s known as The Blitz was marked later that year by Black Saturday. It was reported that 348 German bombers, accompanied by 617 fighter planes attacked London on September 7, 1940. Around 1000 bombs and other incendiary devices were dropped on strategically important areas, like The Royal Docks. One hundred and forty six people were killed in East and West Ham alone, with the death toll across London reaching close to 500. Many stories of that dramatic first weekend of The Blitz were collected by London Borough of Newham Heritage & Archives. You can read this remarkable document here. “I was down Rathbone Street; there was quite a mob of us and it was a red hot day. The planes came over and the bombs were falling before the sirens had even gone, and we just made one dash for it. We didn’t even know what was going on. We knew it was war but being kids of 11 we had never seen anything or heard anything like it before – it was quite a shock. “A sister of mine was running up Hermit Road looking for us; she dragged us back home; she threw us down the shelter. My sisters were lying on top of all us young ’uns and we lay there like that for two and a half hours. You could actually feel the bombs as though they were hitting underneath the shelter -like there was someone underneath punching the mattress from underneath. It was murder… it was murder. “After a period of unemployment, my mother saw in the Stratford Express, the advertisement that they wanted boys between the age of 16 and 18 for messenger work – ARP. So I applied for that, and I was taken-on: ‘D.D. 29’. “The bicycles were available, the very tall parson type ‘yellow canaries’ all painted yellow, so that they could be well recognised. But if you used your own bicycle you got half-a-crown extra for wear and tear. So I used my own, the half-a-crown was handy. 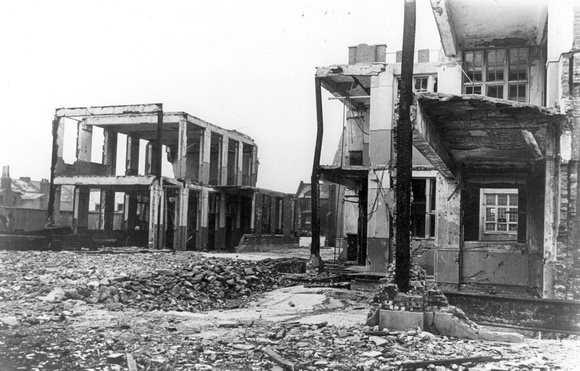 Three days later, a bomb hit South Hallsville School in Canning Town (pictured), killing families who had lost their homes, as well as people waiting to be evacuated from the war-torn docks. In a tragic mix-up, buses sent to transport the evacuees to safety were sent to Camden Town by mistake. The official death toll at the time was 73 people, but various reports claim that between 400 and 600 people died. Limited press coverage of the tragedy is believed to be part of an official cover-up intended to maintain morale and counter potential German propaganda.